Happy Fourth of July to my American followers!!!! How will you all be spending your holiday? For me, I'm still not quite sure. I'm guessing we will end up grilling some food and then possibly going to see fireworks later on in the night. That is, depending on how exhausted I am. I'm working more house than I typically do, and I wasn't sure if I was going to have time to paint, photograph, edit, and create a special Fourth of July post. 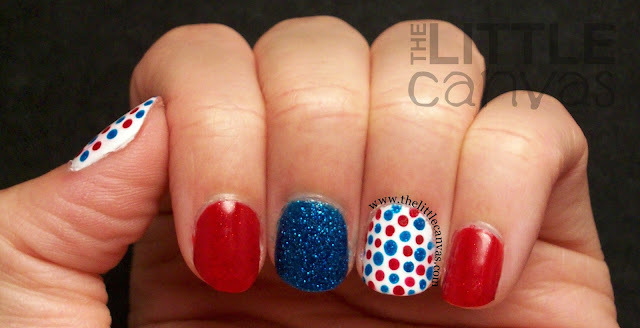 Lucky, I found the time two nights ago to paint this manicure, photograph it after work and before going to a movie, then come home and edit and write all in time for it to post on the Fourth. Go me! Sadly though, it's not the manicure I had in mind. If you follow me on Instagram, you know that I purchased a Star and Heart Hand punch to create easy nail art designs. I've attempted freehand stars in the past, and well it's failed miserably, so when I saw on Chalkboard Nails that you can use a hand punch, I ran to Michael's and purchased one as soon as possible. It wasn't that the hand punch didn't work, it worked great, but I globbered on polish onto my other nails which would have never dried and I was getting really sleepy and needed to head to bed. Look at that glittery Zoya Pixie Dust in Liberty. Stevie is my favorite Zoya Pixie, but Liberty is a close second. Just look at that blue and all the glitter! 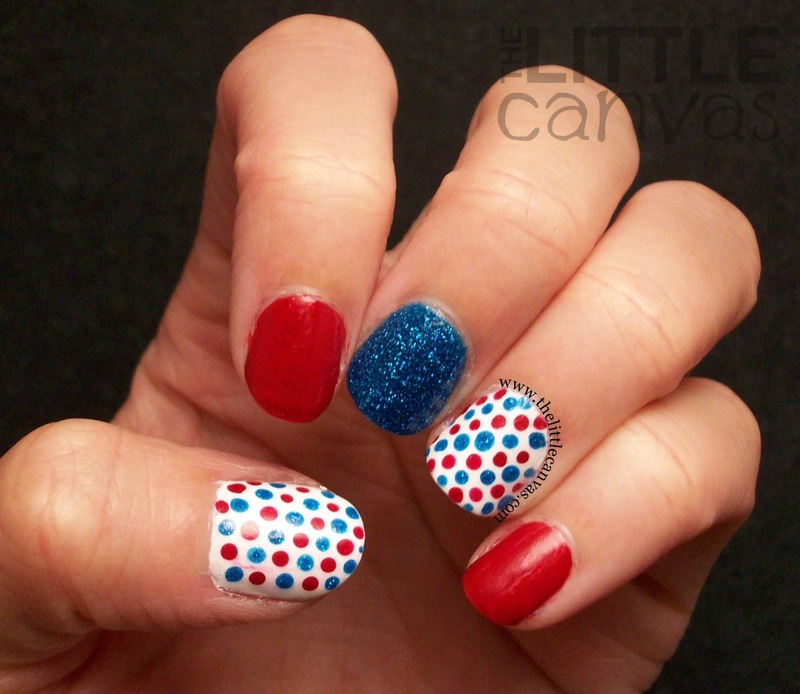 Now, okay, for this photo I top coated it, I really wanted the glitter to sparkle extra since it is a Fourth of July manicure. It sparkled just fine as a matte textured, but crazy Alaina wanted that little extra umph. I originally had on a cream red of Ulta Let the Flames Begin, but I wanted my red to sparkle also. So, on top of a base of Let the Flames Begin, I put on one coat of Red Carpet which gave the nails a subtle sparkle. You can see it more in person than in the photos. If we weren't getting the storm from hell, then I could have taken outdoor photos, but no, everything had to flood and be scary so I was stuck with the light box. With the two polishes, on the white nail I just did some diagonal dots. This tied the manicure all in. What do you think? 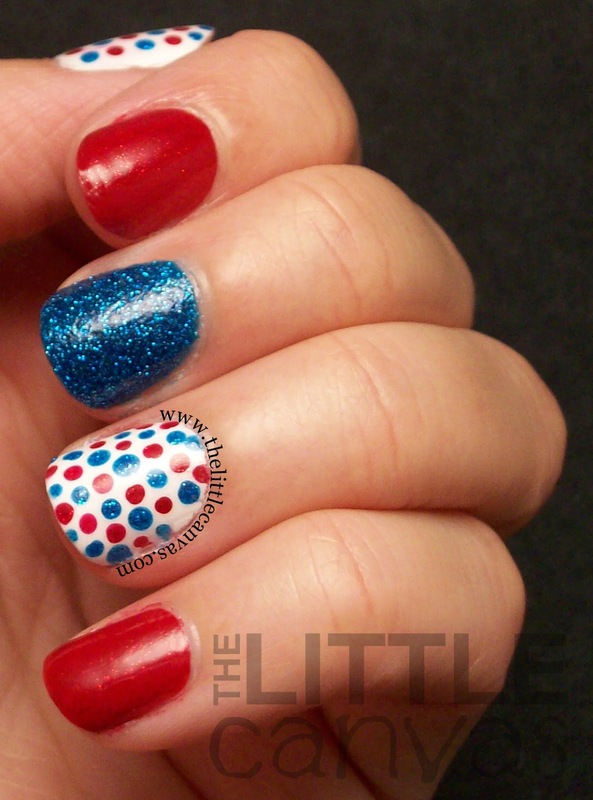 Liking this simple fourth of July manicure?